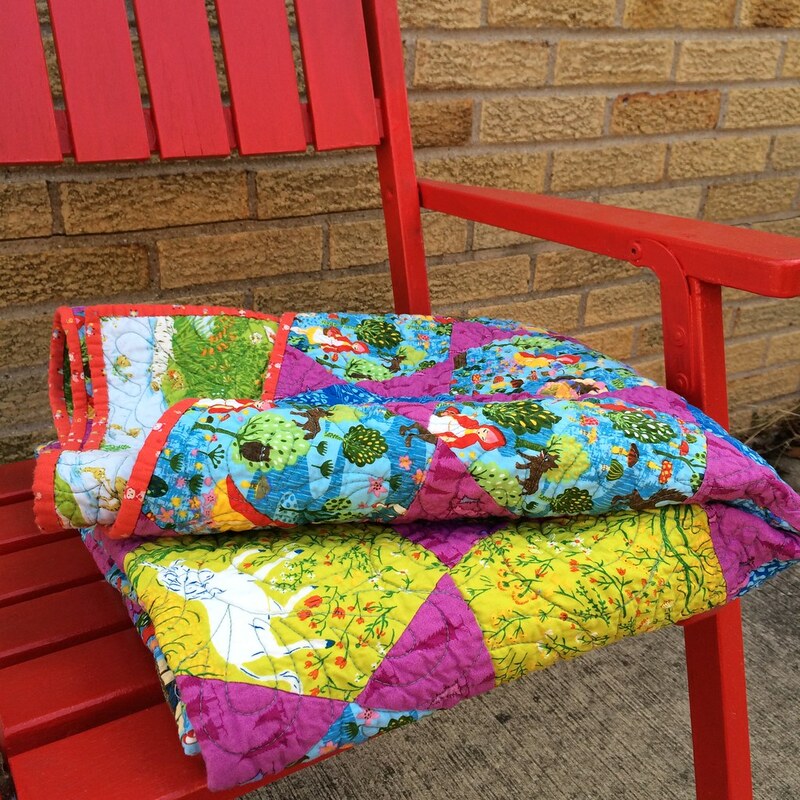 Blotch and Thrum: Red Ridinghood Reading Quilt! 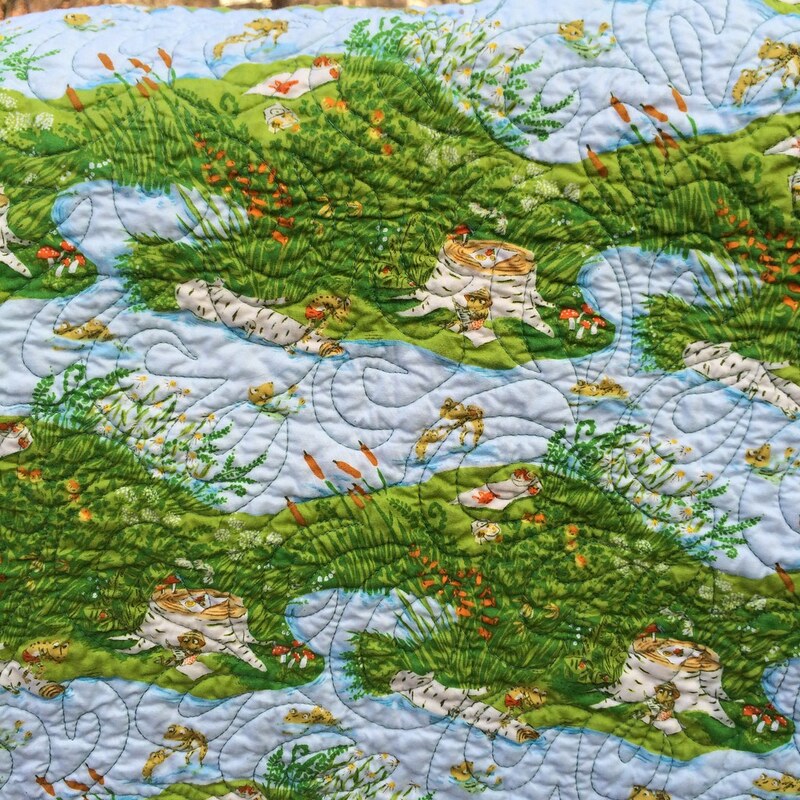 I'm a mom, and at bedtime we read books under one of the many baby blankets I've made, but now that my child is larger, I decided a larger reading quilt was required. I cut out the coordinating triangles long long before the rest, then after the hexagons were cut out, I did the math, and realized I need way more hexagons and triangles. Luckily I scored more of that Jay Carroll print on Etsy, and decided to add in the green unicorns rather than try to find more Ridinghoods or that Sarah Jane tree print. I did fussy cut the unicorns. 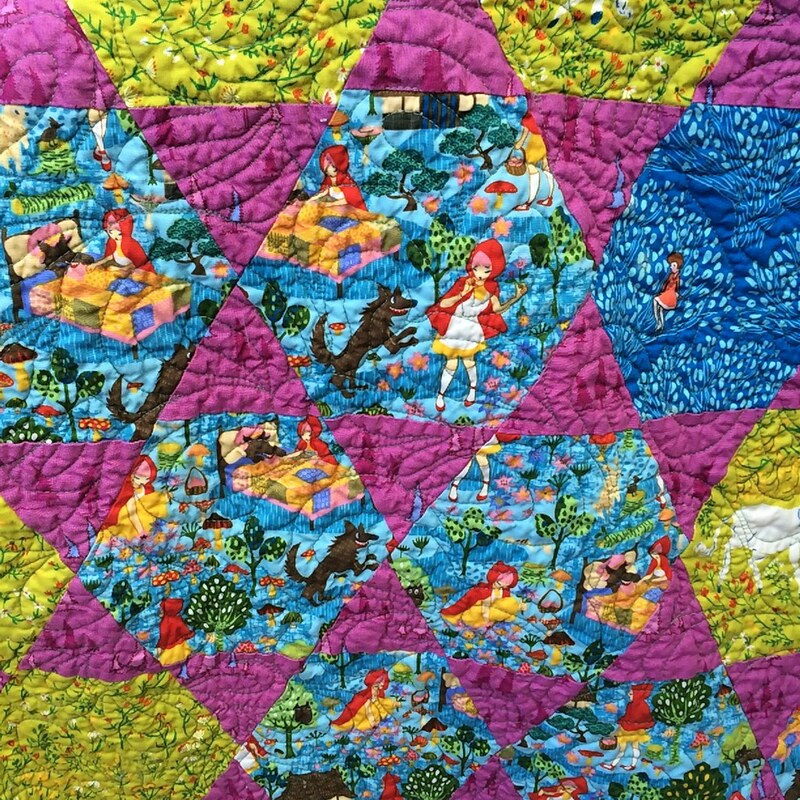 I sewed triangles to the top and bottom of most of the hexagons, then trimmed them to be diamonds, then attached them in rows, then attached the rows, not caring much how they came out. Which is why there is that stripe of unicorns across the top. Not planned. I made it kind of oversized and hacked it down, rather than try to, I don't know, do the math properly? 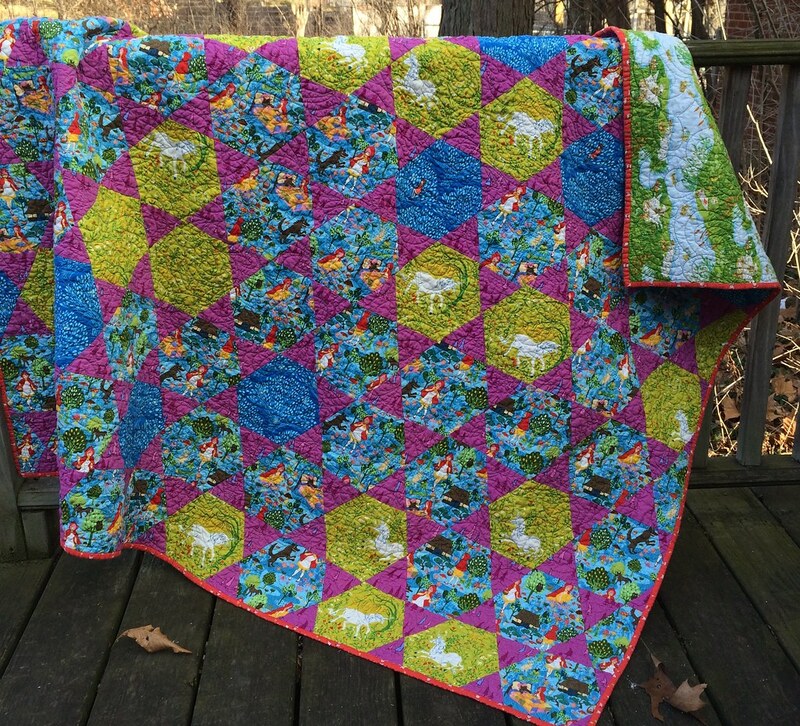 I used Quilter's Dream batting for the first time, and I'm super impressed with it. It's really soft, and the scraps don't pill, and it's really soft. 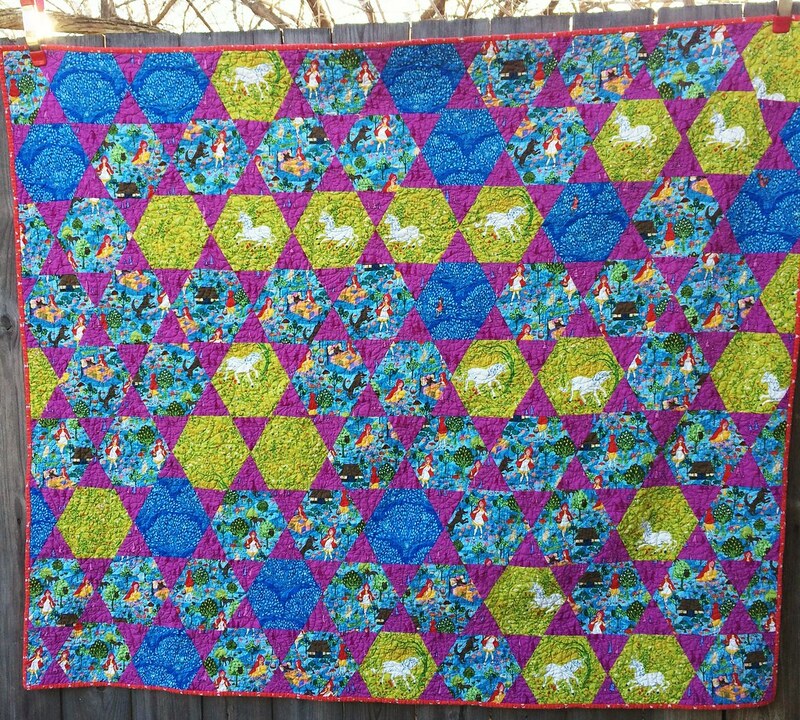 I quilted it using an allover paisley design, from Angela Walter's first book. My early ones were quite stubbly, and the later ones quite dramatic. Either way it holds the quilt together! I could not decided between the blue or the green, so I went with a teal! It's perfect. The back is a Heather Ross print as well. The binding is a Minny Muu print of Kitten Red Ridinghood. So adorable. The true aftermath of this quilt is that I finally purchased my own Hex-n-more ruler. Because next time I have to do one of these, I'm being more careful cutting! Even if it means wasting more fabric.